The Medical Associates Club at the Mystique Community Ice Center is a perfect way to entertain for a company outing ,or a night out with friends and family! The Medical Associates Club features a buffet meal, and a full bar, making it the only place in the arena serving craft beers and mixed drinks. Add a Medical Associates Package Today! Must have ticket to the game. Option to purchase Medical Associates Club package that includes a Front Row ticket, buffet, and two drinks is available for $50. 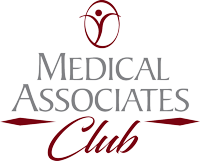 Group rates for the Medical Associates Club for holiday parties and special events are also available.